Apologies for the lack of posts recently, but I was having my very own Excellent Adventure in New York City with some wonderful blogger friends, including The Idiosyncratic Fashionistas, The Style Crone, and Ari Cohen. 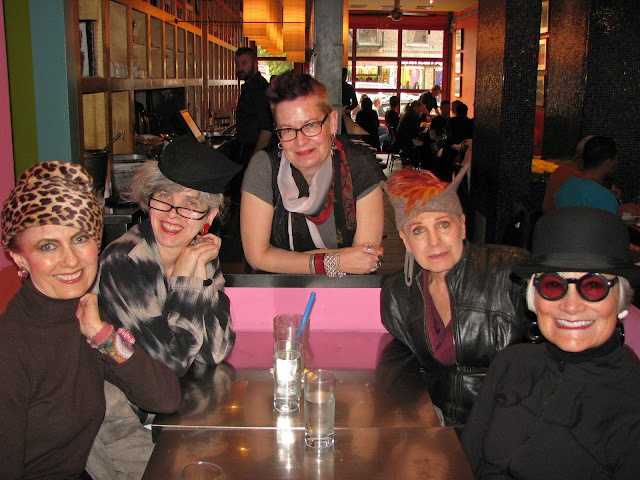 As you can well imagine, there was a whole lot of laughing, taking photos and discussions about hats! I stayed at Leo House, which is a Catholic Christian Guest house located in the heart of Chelsea, and offers extremely affordable, if spartan, accommodations for travellers of all denominations. I stayed there last year and was charmed by the location, which is just blocks away from the High Line Elevated Park, lots of great restaurants, art galleries, thrift stores, and the major event of the weekend, the Manhattan Vintage Show. 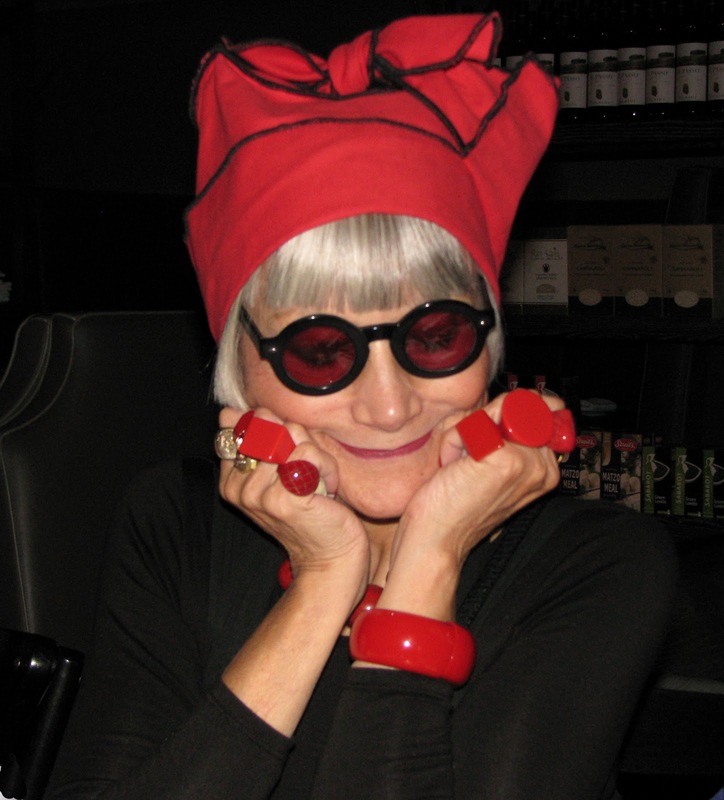 I had been in New York for barely an hour when I ran into marionette artist Jane Folds, who has appeared a number of times on Ari Cohen's blog, Advanced Style. 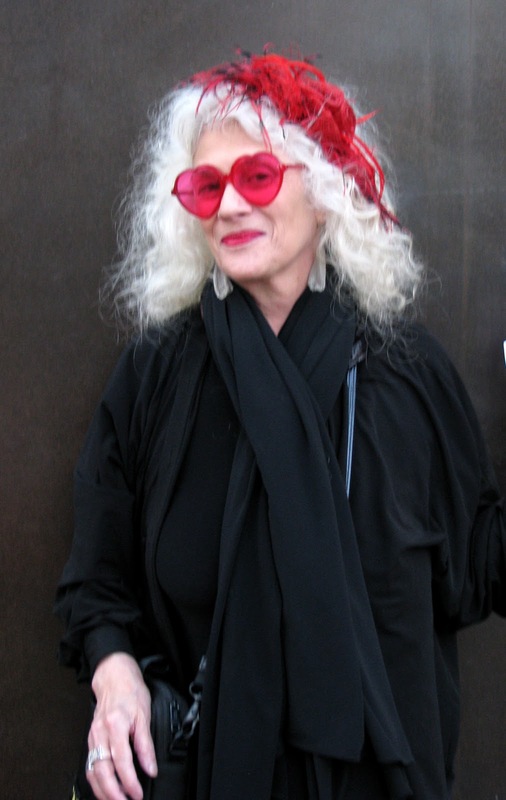 Jane is easily recognizable by her trademark heart-shaped red glasses and beautiful white hair. My trip was off to a great start! 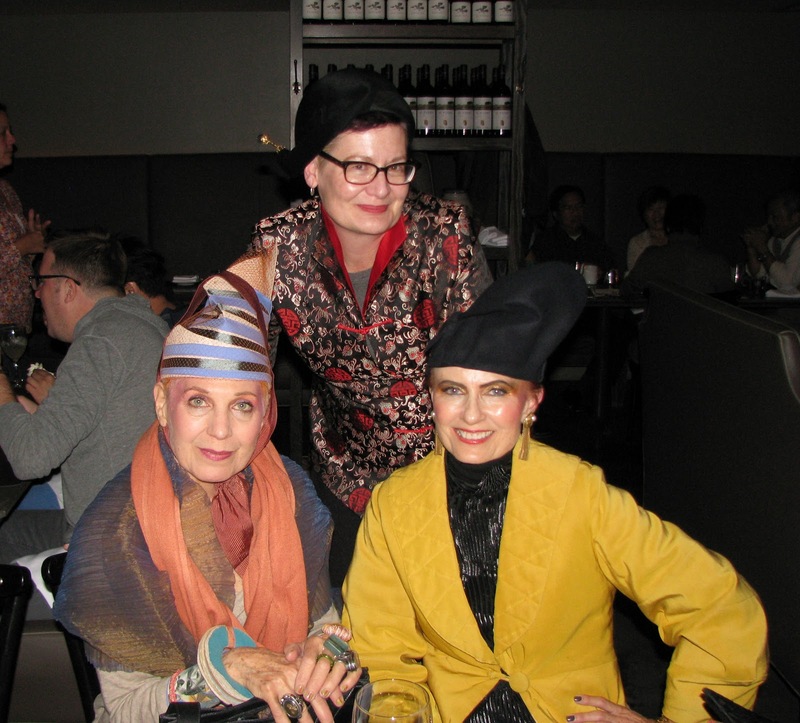 A group of us, including Jean and Valerie of The Idiosyncratic Fashionistas and Debra Rapoport, made plans to meet for cocktails at DBGB, one of chef Daniel Boulud's NYC restaurants. 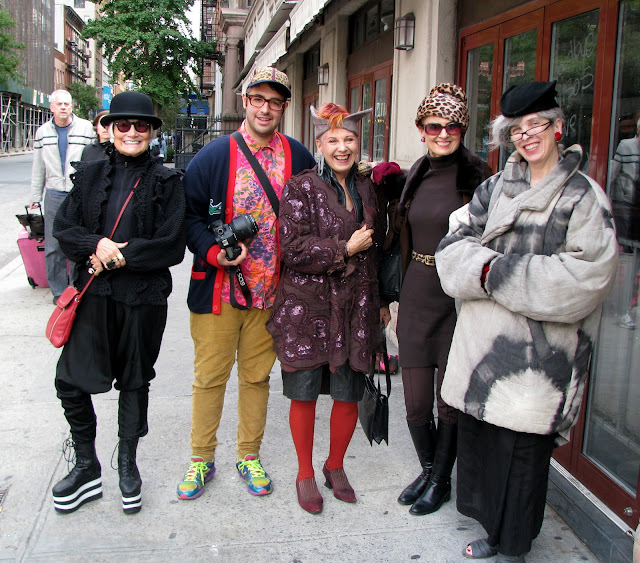 I had met Jean and Valerie, and Debra Rapoport (on the left) last year, and was happy to see them again. This was my first opportunity to meet Judith Boyd, aka The Style Crone (on the right), who I had communicated with via email for the last year. Debra and Judith had participated in a fashion photo shoot earlier that day and were still wearing their dramatic makeup from the shoot. As usual, they both looked stunning. 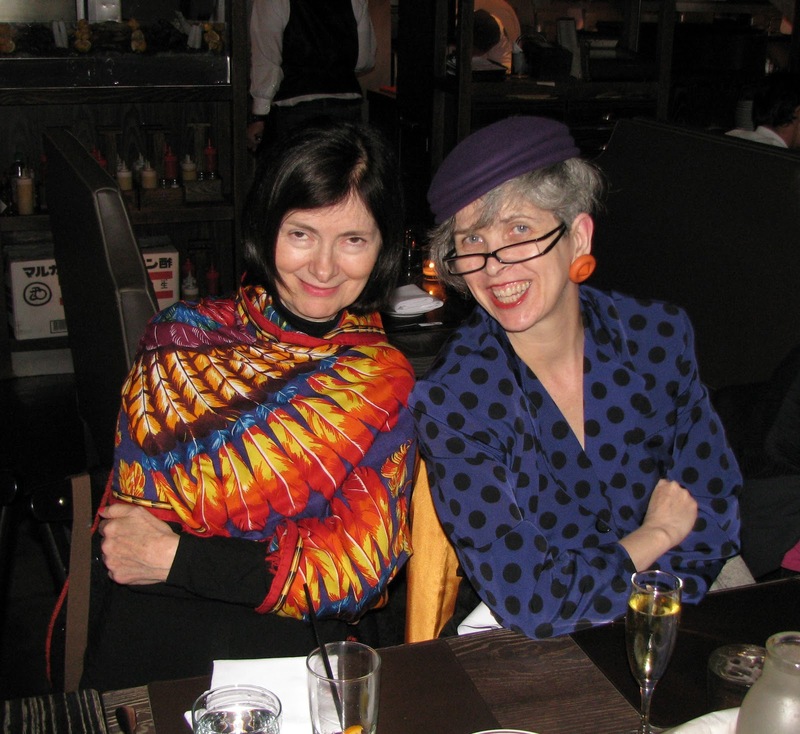 Artist and milliner Carol Markel (left) and Valerie, half of the Idiosyncratic Fashionistas. 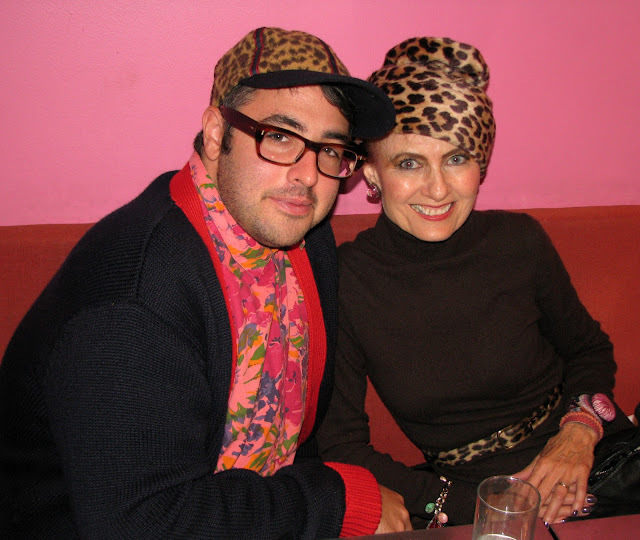 Carol had just returned from Paris, where she purchased her gorgeous scarf. Carol's blog is Femme et Fleur. 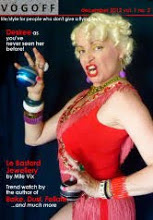 Jean, the other half of The Idiosyncratic Fashionistas, has an enviable collection of bakelite jewellery and this photo that I shot when she wasn't looking shows off her amazing rings. After lunch we moved outside for a photo shoot with Ari. I will always be grateful to him for creating his marvelous blog that was responsible for introducing me to this fabulous group of women! Fed and photographed, Jean, Valerie, Judith and I were off to the Vintage Show. Photos of the people and the clothes in posts to follow. I will be catching up on all of your blogs this week as well. Oh, what wonderful company you keep! Did you buy anything at the Vintage show? Totally worth the wait for these fantastic pictures Shelley! Love seeing everyone together like this. photos and some of the experience! WORDS ESCAPE ME. That is too much fun to compress into 26 alphabetical letters. Wow. All of you are sparkling with energy, beauty, and light!! 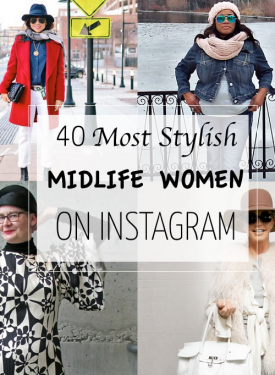 Those women are amazingly fashionable. The photos are fab. This is the blogger meet-up to end all blogger meet-ups! What a fabulous group of woman! I'm so jealous of your New York Adventure. You all look like you're having a blast. Holy dream meet-up!!! How deeply wonderful. Fantastic photos, I am particularly taken by your capture of Jean's candid moment. Everyone looks amazing! I'm with Amber- what a dream crew! You look smashing, along with those other fab ladies, Shelley! I can only imagine how fun you all had together! And Ari, RULES. Oh Wow so so impress Shelley what lucky girl you to have met those lovely Ladies! It was wonderful to meet you Shelley and what an adventure we had. You are even more beautiful and wonderful in person! My heavy dose of makeup is a bit scary, but another one of those 'gypsy' experiences. The best company EVER!! 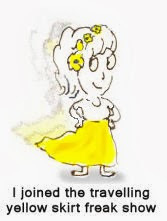 All of us in blogland are vicariously living the dream!! You look gorgeous.